College of Engineering departments host individual spring convocation activities. For information about how to RSVP and obtain tickets, student attire and guest policy, contact your department. The College of Engineering hosts one ceremony, a ticketed event requiring RSVP, for all fall graduates. Students receive emails from the Office of Academic Affairs and departments with information about guest limits, attire, how to RSVP and other event details. For more information about College of Engineering convocation activities, please email Ariel Fisher at arielfisher@email.arizona.edu. 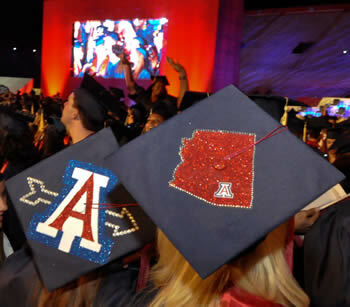 Visit UA Commencement for event details and tips on parking, travel, hotels and merchants. Review the University’s 2019 commencement policies! UA Parking & Transportation After College Stay Connected!